We have made it to the end of the November trajectory that shoots us through Thanksgiving and Black Friday, delivering us to the doorstep of the month of December like a package that arrives early. Our seasonal obligations were relatively straightforward up to this point: make plans to bring our families together for Thanksgiving; navigate complex family relationships and accommodate everyone’s unique (and sometimes crazy) food requirements; wait in line for a discount on Black Friday; and exclaim that December snuck up on us upon looking at the calendar on Monday morning. Suddenly, as though overnight, holiday wreaths have sprung up around malls and holiday lights decorate every nook and cranny of our public living space. The Starbucks cashier wishes you a Happy Holiday, the dentist sends you a Happy Holidays card in the mail, and the world is alive with light shows and holiday editions of foods and drinks. The anticipation of Christmas transforms the landscape of American culture, turning all public venues into celebrations of this non-Jewish holiday. American Jews, particularly those who are Reform, are renowned for our ability to assimilate to the norms of contemporary American society. In fact, the ability to conform to the society of which we are a marginal population has saved Jewish people from being expelled from society altogether for ages. In general, our Jewish rituals are neatly compartmentalized physically: we attend services at synagogue; we celebrate Shabbat with those who are close to us, privately; we light the menorah at home. We are Jews in the synagogue and home, and Americans outside of it. The term “Holiday” represents society’s acknowledgement that other religions—Jews in particular—wish to be a part of American society, one that is founded on Christian values. This term is an attempt to equate Christmas with the Jewish holiday of Chanukah, which usually falls very close to December 25th. In other words, it is an attempt to inject Chanukah with a measure of importance by associating it with Christmas. When the term “Holiday” is used during the month of December, it demonstrates how successfully American Jews have integrated into American society, after centuries of expulsion from communities of every generation. Chanukah is certainly a unique Jewish holiday worthy of celebration, but we must be cautious not to fall into the habit of comparing a minor Jewish holiday with a Christian holiday that is, in comparison, colossal—comparable only to Easter in importance, truly. As Dr. Ron Wolfson explains in his article, “The December Dilemma,” found on MyJewishLearning.com, some Jews will conflate Chanukah with Christmas by telling their children, “’Christmas is for Christians. They have Christmas. We are Jewish. We have Hanukkah.’ In an attempt to substitute something for Christmas, the parent offers Hanukkah.” The challenge that we face during December is teaching our kids about the special significance of Chanukah without comparing it to or competing with the significance of Christmas. The good news is that Temple Beth El’s mission is to provide a super fun Chanukah celebration for every age group. The k/1, 2/3, 4/5, and 6/7 junior youth group advisors have organized Chanukah events for all kindergarten through seventh graders. ALL events for kindergarten-seventh grade will take place on Saturday, December 13th from 3-5 PM. This date and time was chosen purposefully to maximize the convenience of dropping off kids of multiple ages. The LIBERTY board has been working around the clock to plan our Chanukah lock in from December 12th-13th. To find out more about all Chanukah youth, or to sign up and pay online, go to www.beth-el.com and look under “Temple Beth El Community Events” (you will have to scroll down a bit). There is also information about adult Chanukah programs on the Beth-El.com homepage. No matter what age you are, there is a Chanukah event that you’ll love at Temple Beth El. Even though we cannot completely solve the “December Dilemma,” we can embrace the “Holiday” season as a time to remind our kids why being Jewish is unique, special, and cause for celebration. It is the beginning of the school year. It is time to get your kids up in the morning and to make sure they are safely home from school. It is time to start arranging car pools and babysitters. It is the beginning of fall sports, ballet, after-school tutoring, marching band, AP classes, and tons of homework. There are so many reasons why our kids cannot make it to Temple Beth El for Religious School, for youth group events, for madrichim hours. There is no extra time in anyone’s schedule while we are in this back-to-school mindset. Yet, we simply cannot keep kids of all ages away from Temple Beth El. Things have changed since I was a kid in the Northeast. When I was growing up, the first day of Religious School did not entail give-aways and fun assemblies. Youth group meant playing foosball in a tiny lounge for an hour with five other kids. There was no teen band or teen vocal ensemble. After 7th grade, most people saw no reason to remain enrolled in Religious School. In fact, most people chose not to renew synagogue membership after their kids’ B’nai Mitzvah. 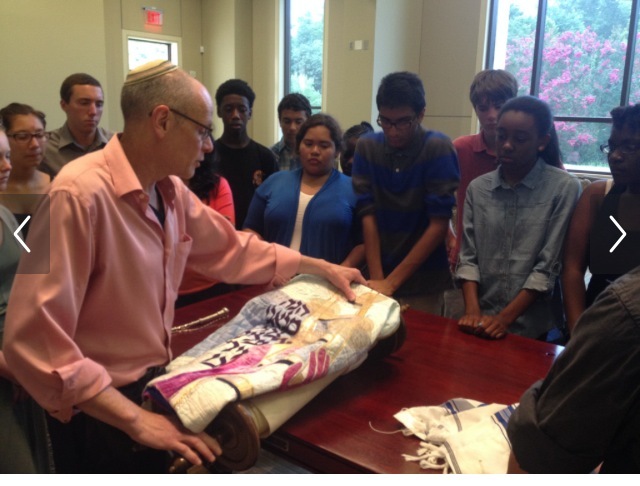 Yet, we simply cannot keep kids of all ages away from Temple Beth El–especially post-B’nai Mitzvah aged teens. To exemplify this TBE phenomenon, let’s shine the spotlight on a special group of teens who refuse to “graduate” out of Jewish learning and involvement after their B’nai Mitzvah: our Temple Beth El Religious School madrichim. I am thrilled that this year 100 8th-12th graders have registered for our madrichim program. That means I have the pleasure of managing 100 madrichim who volunteer in Religious School classrooms, song lead with Ms. Patty for the music specialty, help Yonatan with art projects, assist Sean White in the technology lab, babysit for our Religious School teachers, tutor Religious School children during class time, work with Susan Jacobs and Tracey Lederer in the Religious School office and at carpool, and help out with concession stand. These madrichim are required to be registered for Hebrew High until 10th grade, and 11th-12th graders are required to be involved in a Jewish teen group (such as LIBERTY, BBYO, Teen Band, Teen Vocal Ensemble). The value that these madrichim fulfill is crucial to the mission of Temple Beth El youth programs: the value that Jewish learning and involvement never ends. Take the LIBERTY board, as another example. For two days during summer break, the seven teens in charge of ALL programming for our senior youth group buckled down in the TBE youth lounge to start planning events for the school year. It was sunny and warm outside, a perfect pool day. But the LIBERTY board preferred to stay indoors to make sure that they could organize the best possible events for LIBERTY 8th-12th graders this year. The LIBERTY board meets several times each month and puts many hours into their role as youth group leaders. I am proud to be an advisor for the youth-led LIBERTY senior youth group, and to give support to the LIBERTY board. Take the LIBERTY board, LIBERTY song leaders, and LIBERTY grade representatives, as a third example. All of these hard working LIBERTYites had a long week of school last week, yet on Friday afternoon they boarded the bus to the Liz Leadership Training Institute to gain the skills necessary to be effective Temple Youth Group Leaders. Instead of sleeping in on Saturday and Sunday, these leaders were working hard in break-out networking sessions to learn how to plan and implement meaningful youth group events at Temple Beth El. How does Temple Beth El support the masses of kids who cannot stay away from our Jewish community? I want to highlight the invaluable work of the Youth Engagement Committee (YEC), led by co-chairs Liz Morgan and Carissa Schlesinger, with direction from myself and Rabbi Freirich. Our committee meets once a month to work on different aspects of youth programming that benefit TBE kids of all ages. If you are a new member of Temple Beth El, it is only a matter of time before the YEC Member Outreach coordinator, Brian Yesowitch, shoots you an email to tell you about our incredible youth programs. Several of our committee members volunteer to serve as junior youth group “liaisons,” where they help facilitate the programs so that all of the activities run smoothly during the event. If you have a teen who is involved in NFTY, the Youth Engagement Committee will be responsible for organizing layleader volunteers to house, supervise, and feed about 350 teens during Spring Kallah, the NFTY regional convention, at Temple Beth El in April 2015. If your teen is graduating high school this year, they will be invited to a Graduation Shabbat ceremony and service organized by YEC Graduation Shabbat co-chairs Liz Morgan and Holly Gainsboro. Once your teen leaves for college, Nathalie Malter, the YEC College Connection chair, will keep them connected to their Beth El families by mailing care packages and by organizing TBE College Connection reunions. Our plan to consistently and reliably promote youth events is being spearheaded by Beth Lewis, the YEC Communications Coordinator. Our committee also serves the vital role of fundraising for youth scholarships, so that cost is never a barrier to participation in our youth programs. What are some examples of YEC fundraisers? Nathalie Malter is an expert at coordinating our fall Autobell fundraiser; Brian Yesowitch and Rabbi Freirich take the lead on our March Madness brackets fundraiser; this year Andrea and Mara Gose will take charge of the January Bingo fundraiser; finally, you can thank the Youth Engagement Committee bagel chairs Alison Levinson and Janna Stein for those bagels that we sell at Religious School every Sunday. With the year-round dedication of this committee of parents and lay leaders, the success of Temple Beth El youth programs is guaranteed. It is no wonder that our kids never want to leave Temple Beth El with such a strong support for our outstanding youth programs. How can you support Temple Beth El Youth programs to start the New Year off right? Come to the K-7th Grade Bingo Tournament and Ice Cream Social on October 11th, from 3-5 PM to learn about youth group, meet other youth group families, and learn how you can become involved. Support our fundraisers throughout the year to help us raise enough money so that cost is not a barrier to participation in youth events. Stay updated by reading the upcoming events on the weekly congregational emails and by reading bi-monthly “News for Jews” e-newsletters. I am so grateful for the way our community supports youth programs, and I am looking forward to a fantastic year at Temple Beth El. “Summer” is the smell of cold pool water on hot concrete, the taste of barbecue (although, as a vegetarian, I prefer grilled cheese), the feeling of the hot sun after months spent trapped indoors. “Summer Camp,” for many of our Temple Beth El kids, means building and strengthening Jewish identity through innovative programs. I am a firm believer in summer homes. I have gone to sleep-away camp since I was eight years old and was a camp counselor for one summer. This is why I am thrilled that the summer abodes of many of our Beth El kids are at Jewish camps. Since this is my first full summer as a “Charlottean,” I experienced three incredible Jewish summer experiences for the first time: URJ Camp Six Points, Mecklenburg Ministries In Our Own Backyard interfaith camp, and URJ Camp Coleman. 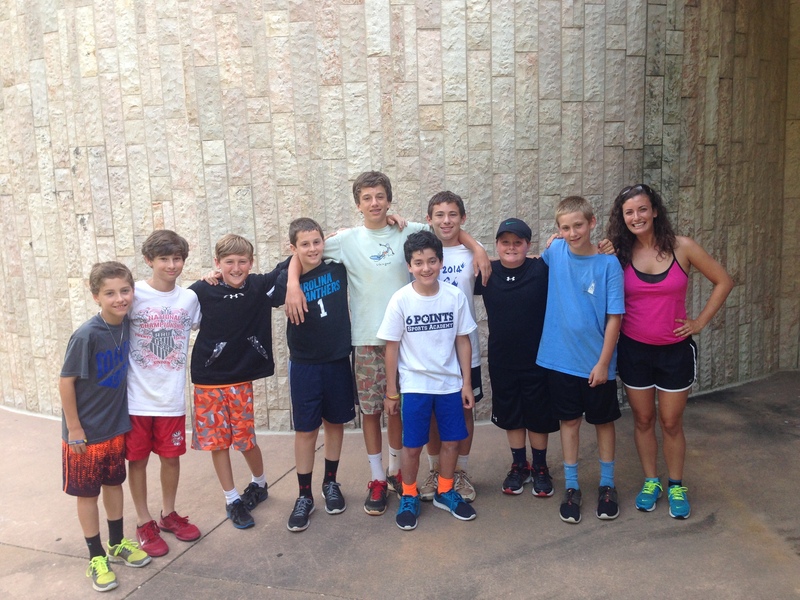 Sports and Judaism—I never imagined how well they could go together until I experienced the magic of Camp Six Points, my first camp stop of the summer. I was honored to have been invited to serve as visiting faculty member for URJ Six Points Sports Academy, which uses the sparkling (and air conditioned) facilities of the American Hebrew Academy in Greensboro, North Carolina. I joined several Charlotte campers for a session in which enrollment exceeded 200 campers. According to the staff, they had more campers in that single session than they did in all the sessions combined just a few years ago, when the camp first began. Even though the Six Points program promotes a non-conventional approach to Jewish education, this camp converged with Jewish learning in a very traditional way: Jewish learning was frequently centered around meal offerings for the day. The staff and campers participated in song session in the chader ochal (the cafeteria), prayers before and after each meal, and a special Shabbat dinner complete with Challah and candles at the end of the week. Every morning at breakfast, three or four staff members would perform a skit to act out a “Jewish Value of the Day.” Once that Jewish value was taught, the campers could earn bracelets with the Jewish value printed on them as a reward for exemplifying that particular trait. 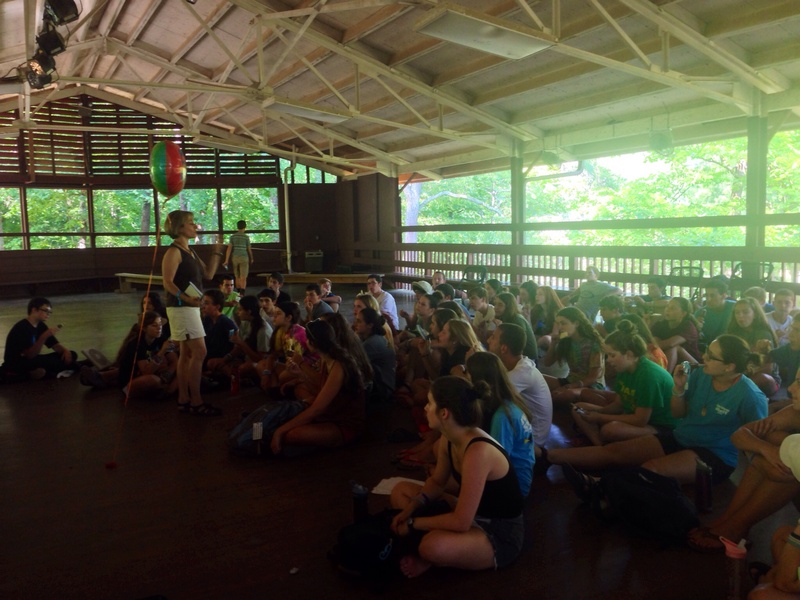 While I was at camp, we learned Jewish values of Community, Loyalty, and Compassion. When kids exemplified these values, they earned respect from their counselors and coaches in the form of bracelets. I loved taking pictures with our Temple Beth El crew at Six Points! I was also fortunate to be able to spend an entire week with the Mecklenburg Ministries “In Our Own Backyard (IOOBY)” Interfaith youth camp, directed by Jason Williams. Three Beth El teens, Abby Levinson, Darien Lewis, and Arthur Valdman, participated in the camp along with 17 other rising 9th-12th graders of different faiths. The religions represented by the IOOBY participants ranged from Christian, Jewish, Muslim, Hindu, Baha’I, and Unitarian Universalist. The teens spent the entire day in the sweltering heat experiencing “A Walk in Their Shoes,” a simulation of what it’s like to be homeless. 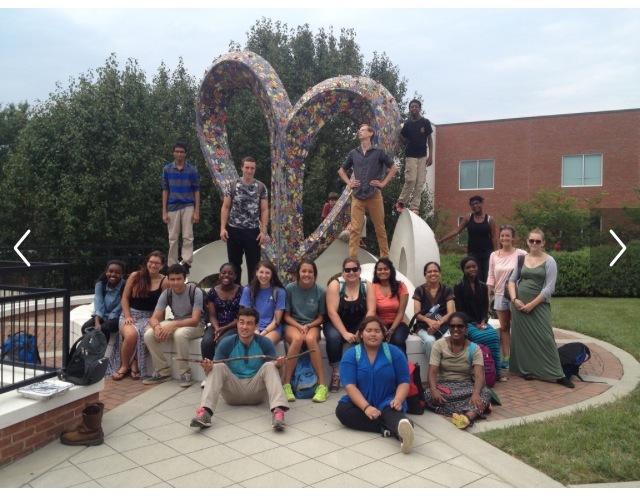 We visited the Bahai Temple, meditated with a Buddhist monk, did Yoga at the Hindu Center of Charlotte, learned about Unitarian Universalist teachings and celebrities, experienced a Catholic mass, participated in Muslim prayer during Ramadan, and ended our trip at Temple Beth El Shabbat services. In between visiting all of these incredible houses of faith, we did community service projects around Charlotte. The IOOBY teens volunteered at “Sow Much Good,” a community organic garden; we helped the volunteers at Freedom School Field Day; we sorted clothes at the Crisis center and sorted food at Second Harvest Food Bank. Our mode of transportation to all of these sites was the public bus system, so that we could experience first-hand the challenges of poverty in Charlotte. At the conclusion of camp, the teens prepared and presented an interfaith service for their parents in which each teen told the group how the different visits to religious centers and community service projects had an impact on the group. It was so touching to see how the next generation of leaders demonstrated a level of compassion and understanding that allowed them to celebrate their differences and create a strong bond that united these teens–not in spite of their different faiths, but because of the differences in their beliefs. The last stop of my summer camp swing was Camp Coleman, which I visited for one day with Rabbi Judy and Max Wallach. Jewish tradition teaches that when you visit the sick you take away 1/60th of the illness. It also teaches that dreams are 1/60th of prophecy (of God speaking to us). And Shabbat is 1/60th of the World To Come. We would add, after spending Shabbat at our Reform movement’s Camp Coleman, that Coleman is also 1/60th of heaven. Our 21 Charlotte kids who attended camp Coleman this summer would agree. 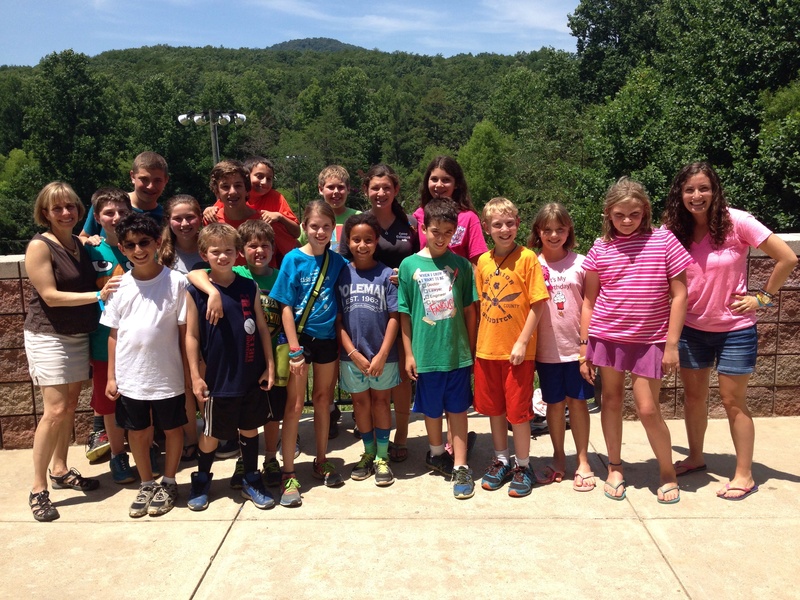 Rabbi Judy and I visited Camp Coleman today to hang out with our Charlotte and Temple Beth El campers. Marlene Rosenzweig and Lori Handler put together gift bags for our kids that we handed out after lunch. After mandatory optionals, where kids are required to make tough choices between playing in the lake, swimming in the pool, or eating fresh chocolate pita baked over a fire by the Israeli staff, among many more options, Rabbi Judy and I taught the 53 rising 10th graders, known as the Coleman Chalutzim. We celebrated the 50th anniversary of Freedom Summer with a festive balloon and cookies while overlooking Lake Shalom. We had a great debate as to whether 50 years ago they would have made the choice to give up working a summer at Coleman during their college years to register African Americans to vote and to teach at Freedom Schools in Mississippi in 1964. They understood why, as Jews, they might do this mitzvah of fighting for civil rights. We are so proud of our 21 incredible kids who chose Coleman, the 24 who chose Camp Six Points, and the 3 who represented Temple Beth El in the Mecklenburg Ministries interfaith youth camp. Our community and our movement are blessed to be able to offer so many different opportunities for engagement for our youth during the summer. If you are looking for the perfect Jewish summer experience, do not hesitate to ask our clergy or educational staff! Jewish tradition teaches that when you visit the sick you take away 1/60th of the illness. It also teaches that dreams are 1/60th of prophecy (of God speaking to us). And Shabbat is 1/60th of the World To Come. We would add, after spending Shabbat at our Reform movement’s Camp Coleman, that Coleman is also 1/60th of heaven. Our 21 Charlotte kids who attended camp Coleman this summer would agree.